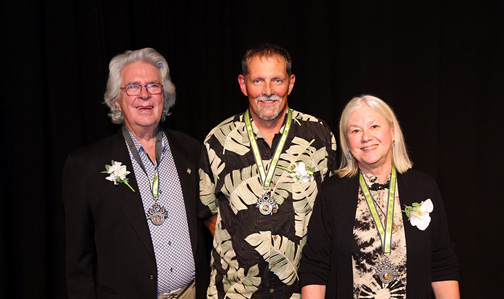 Heidi Greco, Robert Gary Parkes and Jim Trimble, Surrey’s newest Civic Treasures, were officially honoured last evening during the annual Business and the Arts Reception at the Surrey Arts Centre. 2017 marks the Civic Treasures Awards’ 10th anniversary celebrating artists, advocates and community leaders for their contributions to the City’s arts and cultural sector. 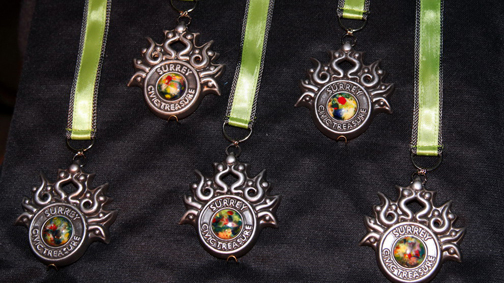 42 Surrey residents have been named Civic Treasures since the program’s inception in 1997. For over 30 years, Heidi Greco has advanced the appreciation and development of the arts, especially the literary arts – through teaching, community involvement and her own craft. Greco has initiated or been involved in many local events and literary projects, and was a driving force behind the establishment of Surrey’s first Poet Laureate. She has published several volumes of poetry and a novella. Her most recent book Flightpaths: The Lost Journals of Amelia Earhart was published in Spring 2017. Robert Gary Parkes is a professional artist and accomplished master glassblower. Well known for his work among glass artists across Canada and the Pacific Northwest, Parkes operates the Loafing Shed glass studio in Port Kells, opening his studio on a regular basis to the community for tours and educational demonstrations. His award-winning work has been exhibited extensively, including the Arts Council of Surrey’s annual juried exhibition at the Surrey Art Gallery, and the Mind & Matter Gallery in South Surrey. Jim Trimble is a founding member of The Society for the Preservation of Vaudeville. The Society’s Vaudevillian troupe performs regularly throughout Surrey and the metro region. Trimble’s philanthropic efforts to support the arts in Surrey include establishing a performing arts bursary at Douglas College. Most recently Trimble launched Naked Stage Productions Society which produces for the stage at Newton Cultural Centre. He has been honoured with the Queen Elizabeth Diamond Jubilee Medal in recognition of his leadership with the Vaudevillians.